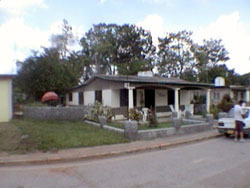 Nice casa with 3 bedrooms to rent. ALl them with private bathroom en-suite, air conditioned, fan and windows. The casa owner does speak very good english and she is always willing to help you in anything you need Rooms provided with air conditioner, vent and private bathroom (shower & hot water). House has living/dinning room, terrace surrounded with ornamental plants, tables and chairs where you can rest, take sun or order breakfast and meals as you wish. From the room you may see the sun rising and from the terrace you may see sunset. It is located at 200 meters from downtown and 250 meters from Viazul Bus Station.